The euro has appreciated 10 percent against the Swiss franc (CHF) over the past year. The U.S. dollar and the Japanese yen have not made similar gains vis-à-vis the franc. Tracking the franc’s movements relative to the major currencies gives an unusual window onto the deflation-fighting credentials of the world’s major central banks. It illustrates, in particular, the European Central Bank’s half-hearted efforts to fight the risk of price deflation. Financial markets have come to believe that the ECB will prematurely tighten monetary policy: hence, despite brief episodes of depreciation, the euro will tend to stay strong, hurting economic prospects in several eurozone member countries. 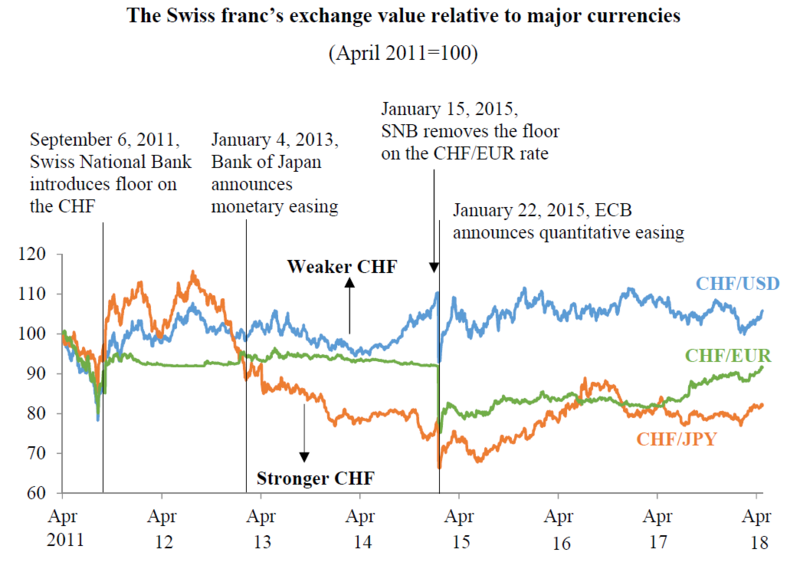 During the summer of 2011, investors fleeing from a crisis-plagued eurozone bid up the value of the Swiss franc to nearly 1.00 CHF/EUR (from about 1.30 CHF/EUR earlier in the year). The increased strength of the franc undermined the competitiveness of Swiss exporters and made imported goods cheaper, which caused Swiss prices to drift dangerously into deflationary territory. Deflation or even the expectation of very low inflation causes consumers to postpone purchases, which causes growth to slow down and debt burdens to rise. On September 6, 2011, Switzerland’s central bank, the Swiss National Bank (SNB), announced it would pull the franc back to a “floor” of 1.20 CHF/EUR. To honor its commitment to restricting the franc at this floor, the SNB bought very large amounts of euros and other foreign currencies. The cheaper franc quickly helped to pull the Swiss economy out of its slump and deflationary price dip. The SNB’s strategy reached its limit in January 2015, by when it seemed imminent to most investors that with the eurozone core inflation rate hovering around at a low level around 1 percent, the ECB was about to announce its much-delayed bond-buying quantitative easing (QE) program. Recognizing that it might not be able to absorb the flood of additional euros, on January 15 the SNB terminated its effort to keep the franc from rising above the 1.20 CHF/EUR floor. The SNB did maintain an aggressive posture against deflation by reducing its policy rate to -0.75 percent, the lowest rate of all major central banks. But the pent-up demand for the franc caused it to immediately and sharply appreciate against the euro, the Japanese yen, and the U.S. dollar. Thereafter, the franc moved at different times and to different degrees against the three major currencies, providing an unusually valuable measure of the willingness of different central banks to fight deflation. By early 2015, the U.S. Fed—having used aggressive interest rate cuts and three rounds of QE to put money in people’s pockets and, thus, preemptively stomp out deflation—was plausibly expected to begin raising its interest rates within a few quarters. Thus, the franc rapidly gave up its gains vis-à-vis the dollar, and the CHF/USD rate returned to the narrow band within which it had fluctuated since September 2011. The Japanese yen maintained its depreciated value against CHF somewhat longer, since the Bank of Japan (BOJ) had, starting in January 2013, promised to hold down interest rates through massive asset purchases under its QE program. But the BOJ had dithered too long and the belated effort proved insufficient. Japanese households and businesses were not convinced that the BOJ would stay the course. Hence, believing that inflation would remain low, Japanese consumers postponed purchases, which kept price inflation low. In June 2015, Governor Haruhiko Kuroda’s comments that the yen had fallen enough raised concerns that the BOJ might slow down its QE before uprooting Japan’s entrenched deflationary psychology. The yen began to appreciate against the franc and the dollar. Meanwhile, low interest rates squeezed the profits that banks earned, which fueled more discussion of exiting QE. The BOJ seemed confused. The yen continued to rise. The euro also weakened after the SNB’s removal of the floor on the franc’s exchange rate. The ECB’s QE program, announced on January 22, 2015, helped maintain a depreciated euro for a little over two years. But from early 2017 onward, the euro area economy strengthened in tandem with the global recovery, and investor expectations grew that the ECB would slow down its asset purchases. Beginning in March 2017, those expectations caused currency traders to bid up the euro’s value relative to the franc and other currencies. With no viable policy options left to ward off deflationary threats, ECB and other European officials resorted to denying that the ongoing euro appreciation was a problem. Such claims flew in the face of facts, as an exhaustive IMF study had shown just a few months earlier, in March 2017. Indeed, IMF economists had noted that exchange rate appreciation, and hence weaker exports and a greater deflationary tendency, were particularly damaging when large numbers of people were unemployed or underemployed, as was (and is) the case through much of the eurozone. By mid-September, the clamor to wind down QE grew from the German members of the ECB’s Governing Council, most stridently from Sabine Lautenschläger but also from Bundesbank president Jens Weidmann. Sure enough, in late October 2017, Draghi announced that from January 2018 onward, the ECB would reduce bond purchases to €30 billion per month, down from €60 billion every month since January 2015. The euro continued to rise in value, extinguishing the possibility of any sustained boost to growth and inflation from the ECB’s QE. The eurozone average core inflation rate remained at 1 percent and Italian core inflation was well below 1 percent (a troubling statistic no one talked about). Yet the ECB’s tightening narrative persisted. At its meeting on March 8, 2018, the ECB’s Governing Council dropped its earlier promise to increase the pace of its bond purchases if economic conditions worsened. The euro resumed its upward march. In the days before the ECB’s April 26 meeting, data showed a sharp deceleration of eurozone economic activity. By now, financial markets had no reason to believe that the ECB would respond by loosening its monetary policy. Thus, for the first time since the SNB had removed its floor, the euro strengthened to 1.20 CHF/EUR, helped now by the ECB’s half-hearted fight against deflation rather than by the SNB’s efforts to defend that floor. The world’s major central banks are today clearly separated by their large and consequential differences in deflation-fighting credentials. The U.S. Fed acted early and vigorously, for which it has been rewarded. Hesitantly at first but with greater certitude recently, U.S. core inflation rates have risen and are projected to cross the 2 percent level in the next several months. Swiss inflation rates have also risen. The SNB understands, however, that it has not won the fight against deflation. Despite the recent help from the franc depreciation, SNB chairman Thomas Jordon has vowed to keep monetary policy ultra-easy, with the policy interest rate at –0.75 percent and, if necessary, intervention in currency markets to prevent the franc from suddenly surging in value. In contrast, the BOJ, despite its valiant recent efforts, may have lost the battle against deflation. The Japanese inflation rate remains uncomfortably low. In early 2013, the BOJ had set itself a target of reaching 2 percent inflation by early 2015. But having several times pushed the target date out, the BOJ has finally given up its effort to predict when Japanese inflation will reach the 2 percent level. I argue in my forthcoming book, EuroTragedy: A Drama in Nine Acts, that the ECB’s long-standing pattern of denials, delays, and half measures—arising from conflicts of priorities among eurozone member countries—makes its deflation-fighting credentials worse than the BOJ’s. Recent exchange rate movements support this assessment. Having started its QE only three years ago and despite having made only limited progress, and facing the looming risk that another downturn could make matters worse quickly, the ECB is ready to give up its efforts to depreciate the euro, curb deflation, and place the eurozone on a stable economic trajectory. A strong and strengthening euro seems destined to remain a nagging reminder of the ECB’s struggle to raise growth and inflation rates. This entry was posted on May 10, 2018 by Menzie Chinn. I’m a bit confused by the way he wrote this. If the message was that the Euro devaluation – which itself came from a smart move by the ECB to run easy money – would be short lived as the ECB would soon chicken out as the Germans fear any inflation – then say that. But he starts with the Swiss woes from trying to peg the franc to the Euro. OK – that may be bad monetary policy by the Swiss. But one cannot blame the ECB for Swiss monetary decisions. So what is this central message here? I don’t think Prof Mody is using camouflage or obfuscating much here. Prof Mody is saying that the ECB should have kept their promise to have continued on and/or “followed through” with QE if inflation started to lag. Which inflation did/has lagged (below the target). As far as Swiss Franc, Mody is using that as a “control” or measuring bar to compare how the different central banks performed on their policy applications. And at the very least he is implying that the SNB did a better job in fighting inflation than the ECB did. Or maybe SNB made a more “valiant effort”?? I know at one point SNB’s head was a complete imbecile, so I am assuming they have changed the head SNB guy since I had read about it a few years ago. I forgot his name, but it must be a different guy now. Philipp Hildebrand is the name of the prior head of SNB who by all appearances seemed to be a complete buffoon. If you go back roughly 7–8 years and read Bruce Krasting’s blog postings about Philipp Hildebrand it’s an absolute laugh riot. If Prof Mody’s opinions jive with or contradict Krasting’s opinions on Philipp Hildebrand I’d be VERY curious to know Prof Mody’s thought’s either way. It was hard to come to any other conclusion reading Krasting’s posts that Hildebrand had no idea what the hell he was doing. Those links may not be in chronological order, but will give a pretty good idea of the story at the time. As before, what a an excellent guest! A couple of observations. About the FED, I agree that it fought early and hard to return its target, but even so, it took surprisingly long time. The question is the next battle, can they stay with in a 0.5% of the target without serious distorting policy changes. Certainly something to watch. As for the ECB, it seems obvious that it is dominated by Germany and acts in its favor. Lesser so for France. So I guess I am saying half measures and denials may not be the underlying reason of the poor performance of the economic pool in totality. But again, I until and if I read the whole book, I am just speculating causes from the outside. As for the SNB, they in the past fought valiantly to remain on a gold standard, but saw the future where every citizen would become a banker for the world with little room for other Swiss industry. Illuminating. Political observations, but informative.